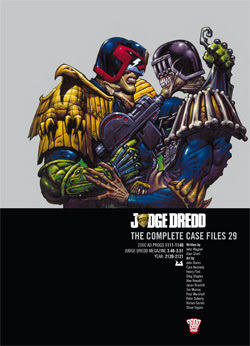 Volume 29 of the Complete Case Files of Judge Dredd is out this week! The latest in the best-selling series collecting the cases of Judge Dredd. From serial killers, to alien dragons, to crime lord Nero Narcos, Mega-City One has more than its fair share of extraordinary perps. Just as well the humble street Judge now has an extraordinary weapon in their arsenal of justice – the Lawgiver Mark II! Whether getting help from day-dreaming desk Judges or the miniature pest-control droids Banzai Battalion, no-one can stop the Law!